Mother’s Day is coming up and being a mom myself, I know how much this day means to moms! Moms work really hard and sometimes feel that they have nothing left in the tank for themselves. Believe me, I talk to my other girlfriends who also are moms and we pretty much all feel this way. With this being said, pamper the moms in your life today (and every day!)! This is a very special day for us moms! 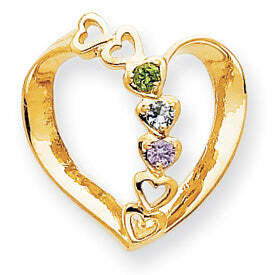 This particular beautiful mother’s heart pendant features 3 birthstones. This would be perfect to represent three children or perhaps you, your wife and your one child. There are no rules to jewelry and you can make any piece represent whatever you like. Use our handy birthstone guide to select the proper gemstone for the month you want represented. Please note that this particular heart necklace is available with 1-7 gemstones. This mother’s heart circle pendant is available with 1-7 gemstones, depending on how many you need. Perfect for any mother or grandmother, she will for sure never want to take this off. What I love about this piece are the hearts that flow in a continuous circle around the piece. 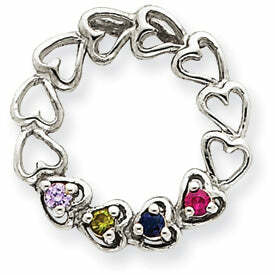 This diamond accented bypass ring can feature 1-6 gemstones. 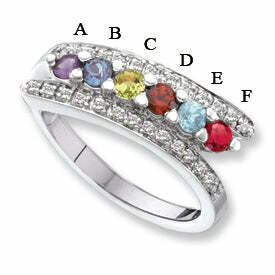 Remember to choose your birthstones in the proper order (birth order) from A to F (for this particular ring). If you have six children to represent, make sure to do it in order from oldest to youngest. I chose this six gemstone ring that could perhaps work for any grandmother in your life. Remember this Mother’s Day to take time to give appreciation to the mother’s in your life. Being a mom is quite rewarding, but also quite hard at times. This is a special day for all moms so be sure to celebrate. If you need assistance with a Mother’s Day gift, please do not hesitate to call on us. We are here to assist you. Happy shopping and more importantly, Happy Mother’s Day from all of us at deBebians.com!